The modern day workplace is entirely dependent on IT systems. The most minor problem could lead to hours of valuable time and revenue lossand this is something that no business can ever afford. 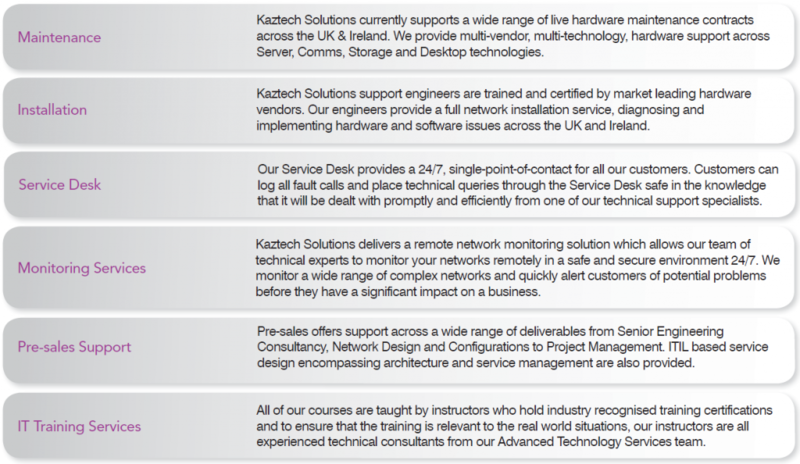 Kaztech Solutions are extremely flexible in our approach to supporting our clients with each individual support contract designed with the customer’s business needs in mind. Kaztech Solutions will not only support solutions that we have implemented but will also provide support on existing infrastructure the client has in place. With several different levels of support, including a block of pre-paid hours, standard 9am-5.30pm Mon-Fri all the way through to 24x7x365, we can even offer you a member of staff onsite every week, it is all dependent on what your business requires. Our service desk will help you easily and efficiently track and resolve your IT issues all built-on ITIL best practices to achieve service excellence. We also provide pro-active monitoring which allows us to easily manage, track assets and monitor all of your desktops, servers and devices on your network. Before entering into any support agreement with a client Kaztech will carry out a full audit of the environment that requires supporting. Kaztech offer this service free of charge as part of our value add offering.